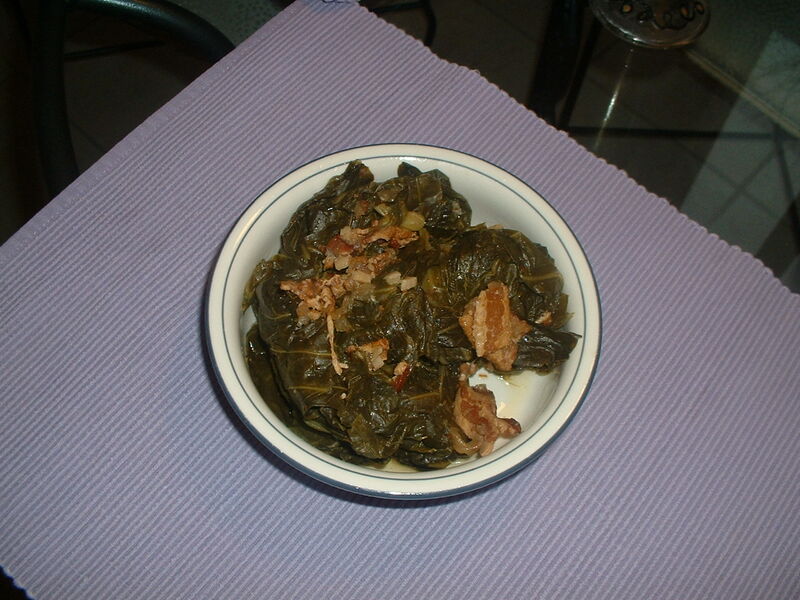 Green beans can be used in place of the collard greens if you cannot get collards. About two pounds of green beans will suffice. Remove the center stems from the leaves of the collard greens. Discard the stems. Cut the leaves in half and rinse them well in cold water. Add the bacon to a Dutch oven. Put the pot on low heat. Cook the bacon until crisp. Turn the heat up to high and add the chopped onion. Cook while stirring for two minutes. Add the garlic. Cook while stirring for one minute. Add the apple cider vinegar. Scrape the bottom of the pot to loosen any of the brown bits that have accumulated. Add the honey, the sea salt, and the chipotle powder. Stir well. Begin adding the collard greens a little at a time until all of the greens are in the pot. Cook’s note: the greens will wilt as they are cooking allowing for space in the pot to get all of the greens in there. Once all of the greens are in the Dutch oven, cover it and place the pot in the preheated oven. Cook for two hours. Stir well before serving to incorporate all of the “pot liquor” at the bottom with the collards. Taste and add more sea salt and/or chipotle powder, if desired.